Life is a cycle round and round. There are times of productivity and there are times of rest. Bear Medicine is the vital practice of deep rest and rejuvenation. This medicine involves minimizing action, conserving energy, and retreating into the cave. It is a time to pad around the house in socks and grubbies and forage the cupboards for snacks between TV shows. Take a break and hibernate. Be a little lazy. You may not have finished the task at hand and you may not want to stop, but it is time to let your mind wander with no particular goal. Wintertime comes whether we are ready or not. Bear Medicine tells us to yield to the natural ebb and flow of our own personal energy. Bear Medicine also teaches how to personally prepare for survival in harsh conditions. Bear Medicine is a forest energy or snow energy of a solitary nature. Bears do not organize into social systems like wolves. In fact, they are often a threat to their own species. A male bear will often kill the cubs of another male in an effort to assert his own lineage. Mothers raise their young without the help of a partner and after two years every cub is kicked out of the den to brave their own adventures alone. Despite this seemingly forlorn dirth of companionship, bears are quite playful, amusing themselves in snow, water, trees and grass. 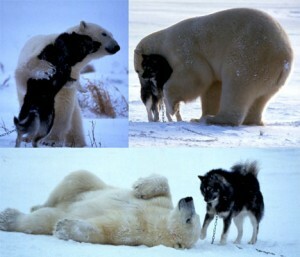 Polar bears have often been observed playing with Huskies in snow camps. Contrary to popular knowledge, bears do not completely hibernate in the sense that their body temperatures only drop a few degrees rather than the drastic degrees that qualify a fully dormant state. For this reason it is easy to wake a sleeping bear. If left undisturbed, however, a bear in semi-hibernation will sleep for several months without waking or leaving the den. Bears are rather progressive and open-minded when it comes to food and they have a widely fluctuating relationship with gaining and losing weight. With the exception of the Panda, who dines on a strict bamboo diet, all other seven species of bear will eat berries, flowers, salmon, and honey, going to intricate lengths to obtain the latter. Bear is akin to the dog family and she is also a distant kin to the raccoon family. Moaning, barking, huffing, growling and roaring are the bear’s means of vocal communication. Physical communication includes standing up to full height on their hind legs. When a bear chooses to do this he shifts his nature from a four-legged being to a two-legged being and instantly asserts his physical superiority over all other two-leggeds. In this way, it is often easy to underestimate bear medicine people until something happens to compel them to stand up to full power. When bear medicine chooses to stand on her haunches and tower to full height, be prepared for an overwhelming presence. Hold your ground but don’t fight. You won’t win with these odds. Even though bears are fierce, they are not predatory in nature (except with their own kind). They do not hunt in the classical sense of stalking and capturing. The closest a bear comes to classical hunting is to stand on a rock by a river during salmon season and wait for fish to literally jump into their mouth. The second efforts of hunting involve foraging your garbage. With this disposition in mind, bear is suggesting you use the tactic of backing off. Let life come to you a bit. Reduce your speed, reorganize the game plan, and take some time to retreat into your cave and meditate. Conversely, bear could also be telling you it is time to wake up and get out in to the light of day. Stop hiding and use your faculties to brave the forest. You are fully equipped with metaphorical fur and claw to tackle whatever obstacle stands in your way between you and your joy. Get out into the fray before you starve to death. Bears are quite sufficiently equipped for adventure and so are you. Take a chance. Make a mistake. Mistakes make you strong.